Digital Illustration: Pierre Klienhouse is a freelance illustrator. 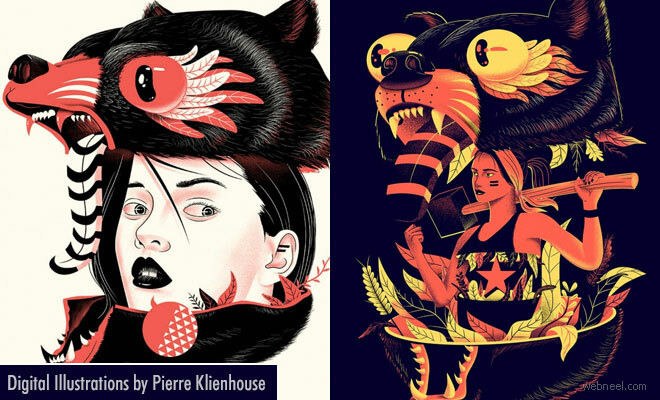 Pierre is also an award winning digital illustrator, painter and artist from Tel Aviv. Some of his notable clients are Stella Artois, BBC Focus, Maxibon, Virgin Mobile, SNCF, Krispy Kreme, UPS, The Museum of Communism in Czech Republic, Oxford University Press, Zack & Quack (Nickelodeon Jr.),Baker & Hill, Red Dot Advertising & Design, Zupi Magazine and others. He loves to create digital art which involves a lot of animals, characters and plants. He mixes his digital illustrations with techniques like silk screen printing. You can find most of his digital illustrations on T-shirts and in branding. Most of the digital art were done as commission works for his clients.